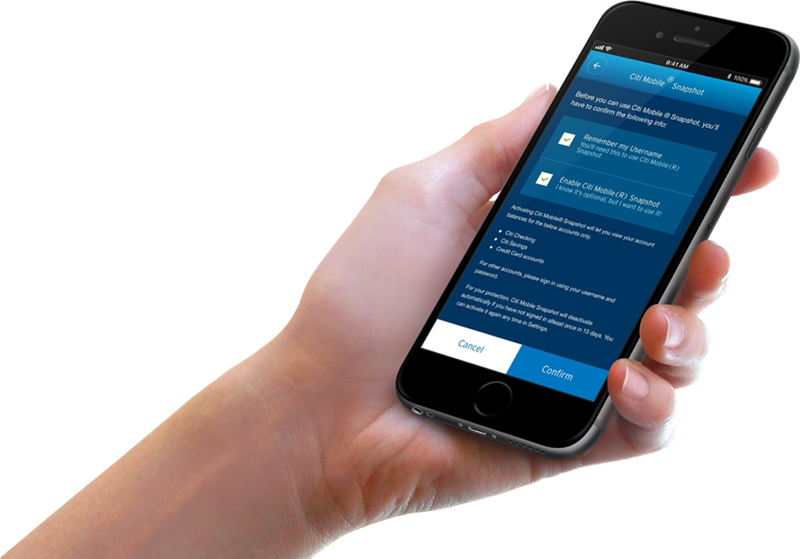 Say hello to the new Citi Mobile® App experience. Get ready for an app that's quicker, easier to use, and most importantly, all about you. We've started with Citi credit card services, designed to give you control over your credit card matters with just a few quick taps, whenever or wherever you are. View the Citi Mobile app. You can now authenticate all your online and mobile banking transactions securely, easily and instantly. Note: This feature is only available on a device running Android 6 and above with a Fingerprint Scanner. You can now use Citi Mobile® to set up and view your scheduled transfers and payments. Set up standing instruction for Citi credit card payments from your Citi Current / Savings Account. A more seamless banking experience is here with the new Citi Mobile® Token, now available via the Citi Mobile® App. Use the Citi Mobile® Token to authenticate all your online banking transactions, as an alternative to other authentication methods like One-Time PIN (OTP) via SMS. 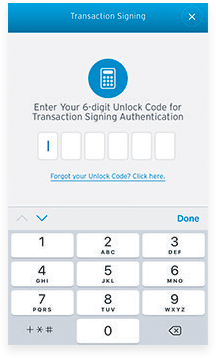 Enter your unique Unlock Code to instantly authenticate your transactions initiated in Citi Mobile® App on your Citi Mobile® Token enabled device. No more waiting for an OTP via SMS. 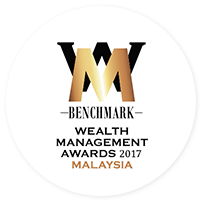 Authenticates all online banking transactions such as payments and transfers, adding a new payee, and updating your contact details. 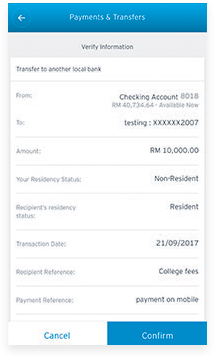 For enhanced online banking security, you will need to authenticate any payments or transfers of RM10,000 and above on Citibank Online and Citi Mobile®. It is seamless on Citi Mobile®. Seamless and secure login with just a touch. Enhance your banking experience on Citi Mobile® app through seamless and secure login with the new Touch ID Sensor. 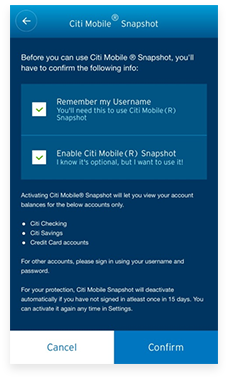 Citi Mobile® Snapshot lets you check your account balance without the hassle of signing in. 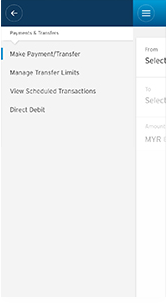 Once you have enabled Citi Mobile® Snapshot, simply open the app and your balance will be displayed. Click on "Enable Citi Mobile® Token" on the sign on page, learn more about it and proceed to sign on. Authenticate yourself using a SMS OTP. Create your personal Unlock Code. You can now start using your Citi Mobile® Token. Tap on Payments & Transfers. 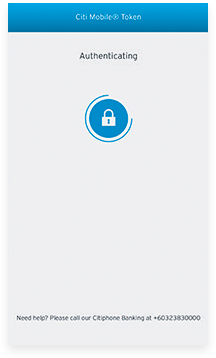 Citi Mobile® Token will authenticate your Unlock Code. Enter your transaction details and tap Next. 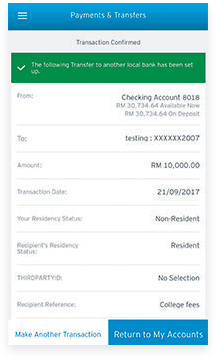 Confirm the transaction details and tap on Confirm. Enter your 6-digit Unlock Code again to authenticate the transaction. Your transaction is being authenticated. And your transaction will be successfully completed! After login, click on the top left button and select Setting > Touch ID / Face ID®. Tick the checkbox after reading and accepting the terms and conditions. Enter the Unlock Code to authenticate Touch ID Sensor. The Touch ID Sensor has been enabled successfully. After login, click on the top left button and select Setting > Enable / Disable Citi Mobile® Snapshot. Tick both "Remember my User ID" and Enable Citi Mobile Snapshot checkboxes. The Citi Mobile Snapshot has been enabled successfully. 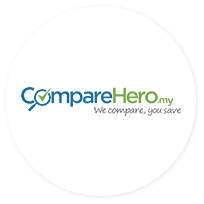 You can choose to split the transactions into monthly instalment plans. Eligible cardmembers can take cash loans on their credit cards, which can be repaid in monthly instalments. Misplaced your credit card? Temporarily lock it to prevent misuse. Found it? Unlock your card with a tap. For iPhone and Android device users — go to App Store/Google Play and type «Citibank MY» in the search bar. Enter the Username and Password you use to sign on to Citibank Online. If you are new to our online banking channels, tap «Register» to set up your Username and Password, which will also give you access to Citibank Online. If you’ve forgotten your Username or Password, choose the appropriate link. If you’ve forgotten both your Username and Password, you can recover them one after the other. 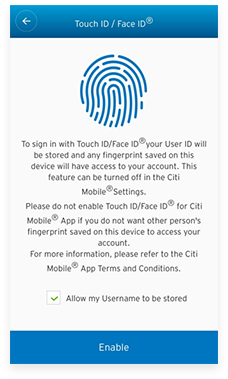 If you use an Apple iPhone 5S or a later model, or a device running Android 6 and above, you can activate Touch ID (for iPhone) or Fingerprint Scanner (for Android) to have quicker access to Citi Mobile® App. To do this, sign on to Citi Mobile® App with your Username and Password, go to «Settings» and choose «Touch ID/Fingerprint Scanner». Download Citi Mobile® App Now! Where can I download the Citi Mobile® app? Go to Apple App Store or Google Play Store according to your mobile device. Search for Citibank MY and download accordingly. Alternatively, click on the App Store / Play Store buttons on this page to download. How do I start using Citi Mobile® app? 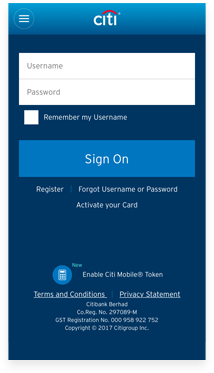 If you are an active user of Citibank Online, you already have the username and password required to access Citi Mobile® app. If you are a first-time user of our online banking channels, you can register on Citi Mobile® app by setting up your username and password, which -can be used to access both Citi Mobile® app and Citibank Online. Alternatively, you can also register for an online account on our website. If your device is using Android -4.4.2 / iOS 5.1.1 or lower, Citi Mobile® will only be accessible via browser at www.mobile.citibank.my for security purposes. What are the benefits of Citi Mobile® Token? • Secure - Your OTP can only be retrieved by inputting a 6-digit Unlock Code chosen by you. This 6-digit Unlock Code will be restricted to the device of your choice. • Instant - Your 6-digit Unlock Code will instantly generate you an OTP. No more waiting for an OTP to be sent to you via SMS. 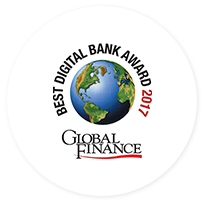 • Easy - Generate an OTP for your online transaction such as payments and transfers, adding a new payee, and updating your contact details. How do I enable Citi Mobile® Token? Step 1: Sign on to the Citi Mobile® App. 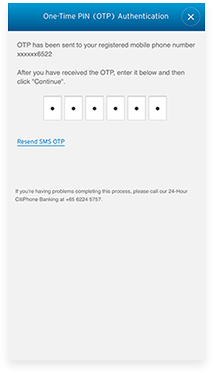 Step 3: Enter the OTP that will be sent to you via SMS. 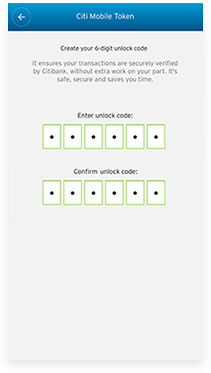 Step 4: Create your 6-digit Unlock Code. When can I use Citi Mobile® Token? 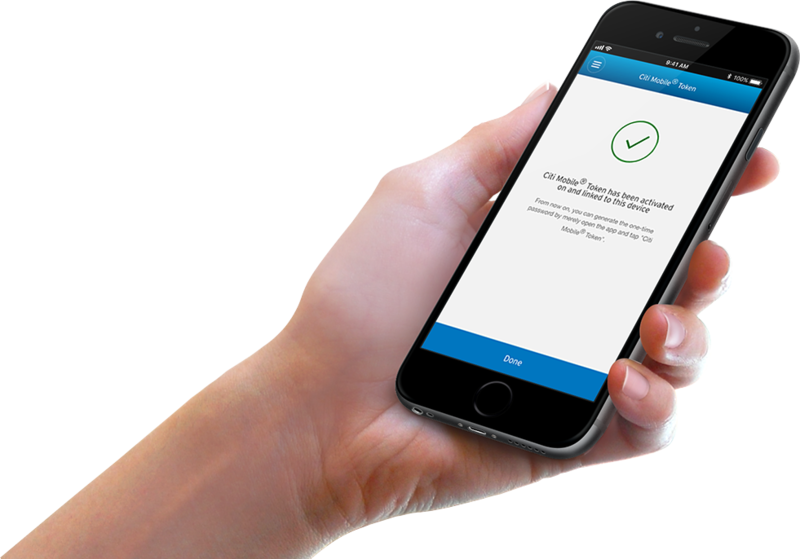 • Citi Mobile® App Authenticate instantly with your Unlock Code for all transaction initiated in the Citi Mobile® App on your Citi Mobile® Token enable device. • Citibank Online Instantly generate an OTP with your Unlock Code from Citi Mobile® App, to be used to authenticate all transactions on Citibank Online. 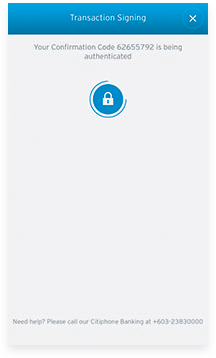 Why do I need to create 6-digit Unlock Code in order to use the Citi Mobile® Token? As the Unlock Code is created by and only known to you, it will then allow only you to have access to the Citi Mobile® Token on your device as well as to generate a One-Time PIN (OTP). Please remember your Unlock Code and do not share it with anyone. Can I still use my One-Time PIN (OTP) via SMS after enabling the Citi Mobile® Token? Yes, you may still use your One-Time PIN (OTP) via SMS as an alternative to Citi Mobile® Token. However, this method of authentication is only applicable for Citibank Online. 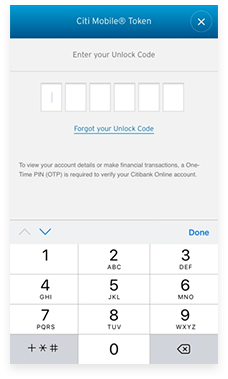 If you are making transactions via the Citi Mobile® App on your Citi Mobile® Token enabled device, One-Time PIN (OTP) authentication is instant when you enter your Unlock Code. There’s no need to wait for OTP via SMS. 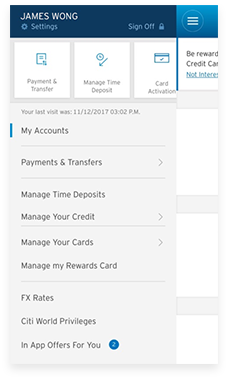 Why am I not able to see the option to generate One-Time PIN (OTP) via SMS to authenticate my transaction in the Citi Mobile® App? 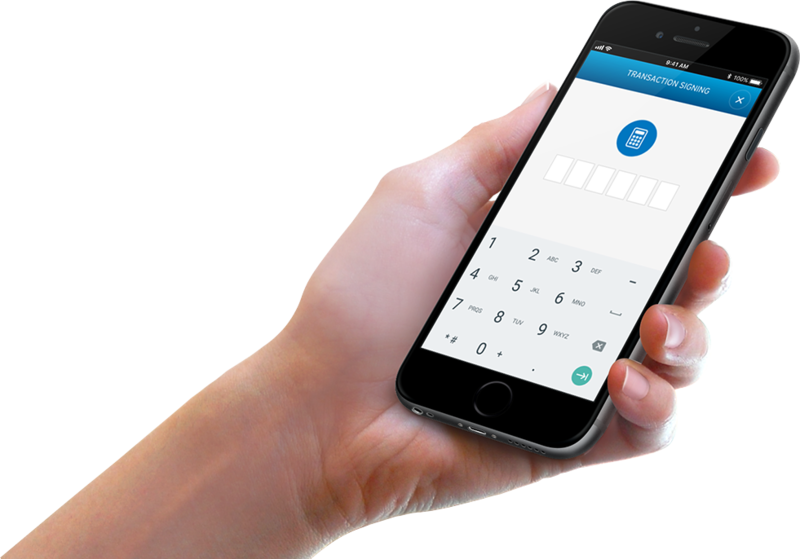 Once you have registered for the Citi Mobile® Token, it becomes your primary mode of authentication for all transactions made through the Citi Mobile® App. The option to use OTP via SMS will be made available only if your authentication via the Citi Mobile® Token is unsuccessful. How do I use the Citi Mobile® Token when performing transaction in the Citi Mobile® App on my Citi Mobile® Token enable device? Step 2: Enter your 6-digit Unlock Code when prompted. Step 3: One-Time PIN will be authenticated instantly after entering your 6-digit Unlock Code. Step 4: Once the authentication is successful, your selected transaction will be automatically completed. 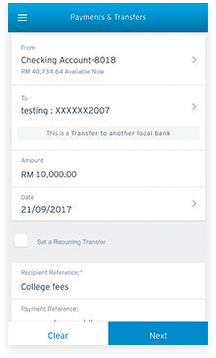 How do I use the Citi Mobile® Token to generate a One-Time PIN (OTP) for banking transaction done on Citibank Online? Step 1: Select "Generate One-Time PIN (OTP) at Citi Mobile® App login screen. Step 2: Enter your 6-digit Unlock Code. Step 3: Enter the OTP generated by the Citi Mobile® Token in Citibank Online where requested to complete your transaction. 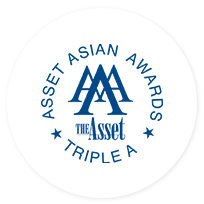 I have enabled the Citi Mobile® Token on my mobile device. Am I able to use my Citi Mobile® Token to perform a transaction on another mobile device? Step 1: Launch the Citi Mobile® App on your other mobile device. An OTP screen will be displayed when you are attempting to perform a transaction and/or activity that requires an OTP. 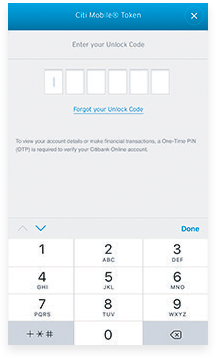 Step 2: On your Citi Mobile® Token enabled device, click on the “Generate One-Time PIN (OTP)” button on the login screen of the Citi Mobile® App. Step 3: Enter your 6-digit Unlock Code. Step 4: An OTP will be generated by the Citi Mobile® Token; Enter this OTP on the other mobile device where your transaction and/or activity is performed. Your transaction and/or activity will be completed upon the successful authentication of the OTP. Can I use the Citi Mobile® Token without the Citi Mobile® App installed? I lost my mobile phone. How do I disable the Citi Mobile® Token? 2. By enabling the Citi Mobile® Token on another mobile device, the Citi Mobile® Token will automatically be deactivated on the previous mobile device. I have a new mobile device. How do I enable the Citi Mobile® Token in my new device? Simply enable the Citi Mobile® Token on your new mobile device. The Citi Mobile® Token will be automatically deactivated on the previous device. Refer to question # 3 to learn how to enable the Citi Mobile® Token. 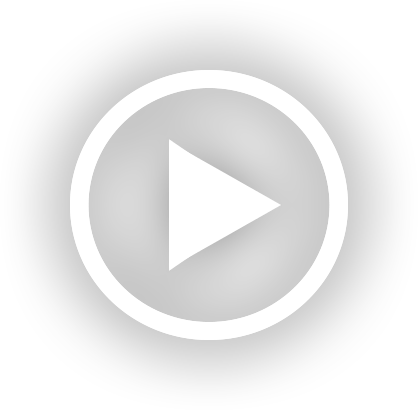 Can I use the Citi Mobile® Token in my old mobile device after I’ve enabled the Citi Mobile® token in my new mobile device? No, you will not be able to generate a One-Time PIN (OTP) on the old device to authenticate your transactions. For security reasons, you can register for the Citi Mobile® Token on one device only. If you have enabled the Citi Mobile® Token on a new device, the Citi Mobile® Token on the previous device will be automatically deactivated. Why is my One-Time PIN (OTP) authentication unsuccessful on Citi Mobile app? Your OTP authentication may be unsuccessful because you have entered an incorrect Unlock Code. 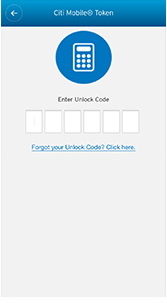 Please try again and note that entering an incorrect Unlock Code more than three times in a row will lock you out of Citibank Online and the Citi Mobile® App. Should you need assistance, please call CitiPhone at 603 2383 0000 from 6AM to 9PM daily. If you have forgotten your Unlock Code, you can reset your Unlock Code. Refer to question # 17 for instructions on how to reset your Unlock Code. Alternatively, you can try to refresh your Citi Mobile® Token from the Citi Mobile® App. 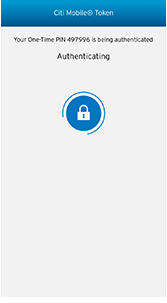 Go to Settings → Citi Mobile® Token → Having trouble? Try resyncing Unlock Code. I have entered the 6-digit Unlock Code incorrectly 3 times (or more) and I am not able to proceed further. What do I do? Please call our CitiPhone hotline at 603 2383 0000 from 6AM to 9PM daily for assistance. I forgot my 6-digit Unlock Code, what do I do? What is Citi Mobile Snapshot? 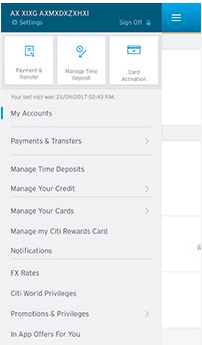 Citi Mobile Snapshot is a feature enabling you to view your account balances of your checking / savings accounts and/or credit card without having to sign on to the Citi Mobile app. If you wish to get more account information or initiate a transaction, sign on to Citi Mobile® app. How to enable Citi Mobile Snapshot? 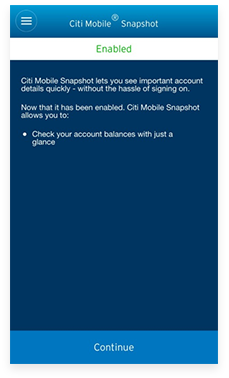 To enable Citi Mobile® Snapshot, sign on to Citi Mobile® app, go to the Settings menu and select Citi Mobile Snapshot. What is Face ID/Touch ID or Android Fingerprint? Face ID is a feature that enables login authentication based on facial map stored on your Apple iPhone X. Touch ID or Android Fingerprint is a feature that enables login authentication based on fingerprints stored on your Apple iPhone device or Android device. It is an alternative login mechanism to Citibank Online Username and Password. I have a few fingerprints stored in my phone. Do all of them have access to my Citibank account? When you enable Touch ID or Android fingerprint login, any fingerprint stored on your device can be used to log on to Citi Mobile app. For security reasons, we recommend that you do not register third party finger prints in your device. Can I disable Face ID/ Touch ID or Android Fingerprint login for Citi Mobile App at any time? Yes, you can disable the Face ID / Touch ID or Android Fingerprint login at any time. Go to “Settings” in Citi Mobile App, select “Face ID / Touch ID” or “Fingerprint Authentication” for iPhone and Android devices respectively, and then tap “Disable”. How long is my Face ID / Touch ID or Android Fingerprint login enrollment for the Citi Mobile App valid? For security reasons, enrollment of the Face ID/Touch ID or Android Fingerprint login for the Citi Mobile App is valid for 90 days. If you have not logged into the Citi Mobile App by manually entering the password within 90 days, the Face ID/Touch ID or Android Fingerprint login will be disabled for the Citi Mobile App. If you wish to re-enable the Face ID / Touch ID or Android Fingerprint login, please refer to the activation steps above.